Since Alessandro Michele was appointed creative director of Gucci earlier this year, the Italian fashion house has undergone some major changes. Prior to his appointment, Gucci‘s most recent sales were more or less stagnant, and the headquarters knew the brand had to make some modern changes, bringing a more youthful vision to anything that was Gucci-related. The reinvention of the renowned Italian brand has at this point been a year-long story, after Tom Ford and Frida Giannini’s attempts to revamp it. However, after all these issues, it seems like the brand has finally managed to find its new path, and has as well invented a new iconic aesthetic that is definitely setting the fashion agenda ” again. This means that, besides the clothing line, Gucci’s public relation system needed to be revamped as well, social media included. 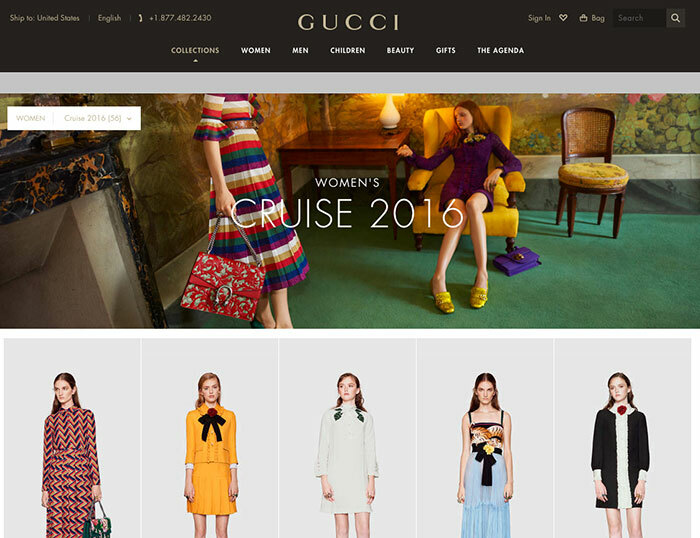 That’s why Gucci has finally opted for a new, updated version of its old-fashioned website, which could meet the demands of its youth-targeted and worldwide audience (the website is for this reason available in 8 languages and its e-commerce functions in 28 countries). 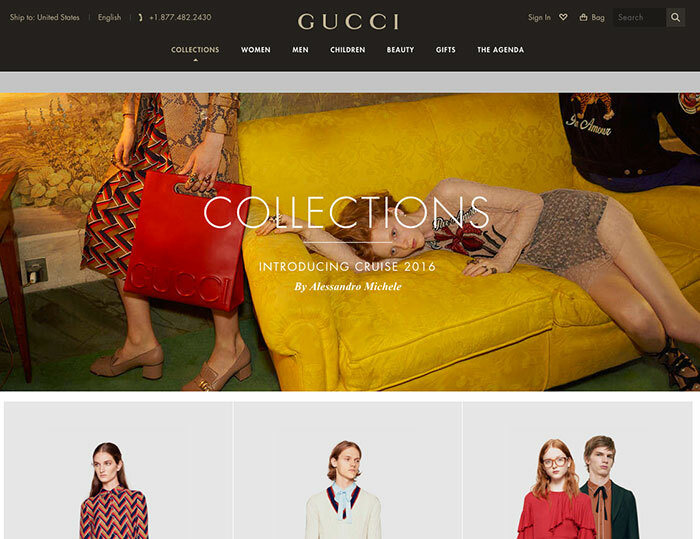 A new Gucci.com went live this Monday in Canada and in the United States (it will be online in Europe, Asia and Australia in 2016), and features more photos, fresh content and intuitive graphics, the vertical scrolling and easy navigation of which make the website look like how Alessandro Michele would decorate his own bedroom. Gucci.com looks more like a personal, yet professional editorial blog, which makes the reader feel more at home rather than at a cold and aseptic shop. The site has added a new section, ‘The Agenda’ (namely a sort of a Gucci’s private diary), wherein any visitor can browse Gucci’s stories and inspirations, both regarding Alessandro Michele and Gucci’s former creative director. Gucci’s integrated storytelling goes hand in hand with Alessandro Michele’s attention to details, whose vintage quirk and passion for accessories and bags make the website look more like a social media rather than an online store. The fact that Michele is an accessories designer at heart and that his inspiration leans towards the nostalgic make browsing Gucci’s new website an emotional and creative experience, which is definitely in line with society’s prevailing trends. In fact, if Gucci’s headquarters’ primary goal is selling product, they have to adapt to society’s new demands, which most of the time revolve around a good, appealing, website. Launched in 2002, Gucci.com has always enjoyed a widespread appreciation. The online store itself attracts more than 100 million visitors every year, which could be translated into a lot of online traffic (and subsequently money). However, the Italian brand has so far not been able to profit from this enormous potential, which is little by little becoming one of the haute couture fashion brands’ main source of income. Gucci.com new aesthetic welcomes a new, younger and more fashionable era, which gives all the Gucci enthusiasts a closer look to the brand’s products, new ideas and inspirations, making her/him more prone to buying something from the online store as well (or at least to sharing its content on the main social media). It is probably not the ultimate solution that will make Gucci rise like a Phoenix from the ashes of its past, but it is definitely an important and significant starting point, which will surely give the brand a break from its latest tumultuous years.